PB&J, It's a classic. Don't leave out your furbabies. Made with chunky peanut butter and fresh strawberries, these are sure to be a mutt pleaser. Peanut butter is a favorite treat of most canines. Not only is it a good source of protein, but it also contains heart healthy fats, vitamin B, niacin, and vitamin E.
The heart-shaped silhouette of the strawberry is the first clue that this fruit is good for you and your dogs. These potent little packages protect their heart and guard against cancer. They are packed with vitamins, fiber and high levels of antioxidants and are a good source of manganese and potassium. You will receive a 1 lb. resealable bag of Peamutty PB&J treats. The treats are approximately 2 1/2" long. These Peamutty PB&J biscuits are made with Chickpea Flour so they are wheat free. Dog Gone Good Barkery treats do NOT contain any preservatives. As such, they won't last as long as store bought! Although, our treats are dehydrated to ensure freshness and crunchiness, if your furry friend does not WOOF them down within 3 months, they can be refrigerated for 6 months or stored in the freezer for up to 12 months. The cookies are hard and crunchy for your dog's healthy teeth but they can be made soft. Soft cookies greatly reduce the shelf life. 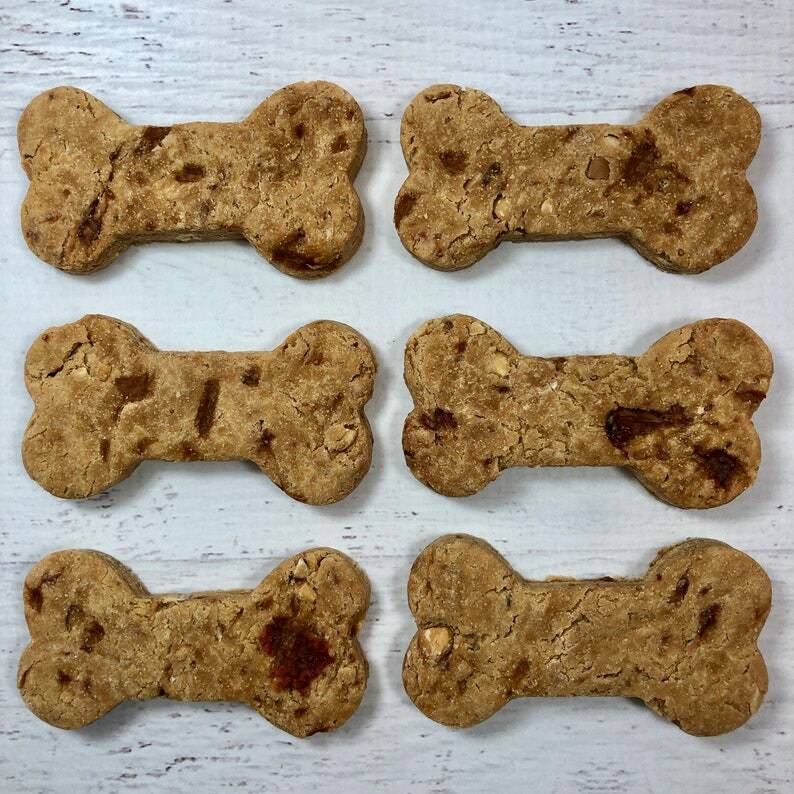 Remember all Dog Gone Good Barkery cookies are freshly made without any byproducts or artificial ingredients. You can be assured you are receiving healthy and nutritious snack for your dog. When in question, please seek advice from your veterinarian as to what food or ingredients are appropriate for your fur babies. Thanks for stopping by the Barkery and have a YAPPY day! Payment is made through PayPal. You may use your Visa, MasterCard, American Express, Discover or eCheck with PayPal. Once payment is received and has cleared, I will bake your order and ship it to you and your FurFamily. If your treats arrive broken or your furbaby is not 100% satisfied, please contact us so we can resolve the issue. We do package with care as not to have your treats damaged in any way. Please do your best to choose treats that will be appealing to your dog based on what you know he/she likes. I cannot guarantee that your dog will like a particular flavor and cannot offer refund based only their dislike of the treats. My Mini Aussies, Clark and Lola love them all! Since we make all treats fresh in the Barkery kitchen and are made to order, we will need 3-5 days to make and bake your order. If you order more than 4 bags of Barkery treats, it could take up to 10 business days. Your treats will be shipped USPS Priority Mail to insure you receive your treats in 2-3 days. I'm sorry but no international orders, please. We love to hear all new ideas and we absolutely adore doing special orders. We have done special orders for a Pug Meetup group and several humane shelter fundraisers. We also will customize treats for your pup's birthday pawty! Please let me know what we can do for you here at Dog Gone Good Barkery.